Aquamarine (from Latin: aqua marina, being, water : sea, i.e. sea water,marīna, from marīnus; of the sea.) is a blue or cyan variety of beryl (which is on of my favorite mineral). The deep blue version of aquamarine is called maxixe. The pale blue color of aquamarine is attributed to Fe2+. Fe3+ ions produce golden-yellow color, and when both Fe2+ and Fe3+ are present, the color is a darker blue as in maxixe. Aquamarine is known as the gem of the sea, it was believed to keep sailors safe and guard against storms. Since the ancient Romans believed that aquamarine was sacred to Neptune, god of the sea, Roman sailors would throw their aquamarine treasures into the water so that they would be protected against any potential dangers while at sea. I drew her with cool aqua promarker, white gelly roll, white pencil, random chinese blue pen in canson XL mixed media pad. Man all of your works with markers are simply top notch! Whoa, those are so rarely stunning, passionate, and exceptional. 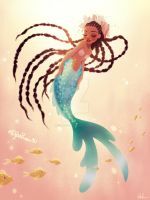 The way you design and make these mermaids is so lovely! You've earned a watcher. The description's interesting, too. ^^ Nice work! How many mermaids-gems things did you draw? It is funny you mention it FF! I used to play with that serie a lot and made buch of fanart of them in high school (though I haven’t played 1O) . Seems some influence stuck with me Thank you for yor nice comment! You're welcome and if you haven't already, then I'd suggest looking up Yoshitaka Amano(the main artist) as the art is amazing! Yes I know him! Eitherway thank you for mentioning! Not seeing much for months and now look at you. Popular 24 DA mainpage! What was the hardest colour to use so far? Awww thank you seems like couple of the mineral and tea mermaids hit off on DA But I am really glad that people like them, in art perspective it wasn’t a good year for me. hmmm honestly speaking orangeish ones were more difficult, but generaly with this series I used much more bolder/ saturated colors then I usually would, so it was more of challage with the darker colors too. Ohhh I see, I see! Mermaids in different hues, what a fun challenge! all of your mermaids are so pretty!